Chapter 24: The Tablets of Ammizaduga. For such significant events as described in the previous chapter, we have surprisingly few accurate written records. From Mesoamerica we have the story that Quetzalcoatl set himself on fire. We do have dates from late Maya sources (the Books of the Chilam Balam), which can be verified against the alignments of Mesoamerican ceremonial centers (detailed in the chapter "Olmec Alignments"). Other than that we have the Phaethon legend from the Mediterranean and a few other curious documents. I'll discuss calendar dates in the year of this event later in this chapter. First I need to establish the year. Among Mesopotamian sources we have, almost as a coincidence, the most curious and frequently misread, Venus Tablets of Ammizaduga -- a 21-year Babylonian record of the appearances and disappearances of Venus. Velikovsky had used the information from the Venus Tablets of Ammizaduga to demonstrate the erratic behavior of Venus in the era of the Exodus of Moses in 1492 BC. The Venus Tablets of Ammizaduga have traditionally been assigned to 1900 to 1000 BC. But an investigation by Lynn Rose and Raymond Vaughan in 1974 (and through 1980) determined that the Venus Tablets of Ammizaduga belonged to the 7th century BC, as others have also suggested earlier. Additionally, despite claims that the tablets represent completely confusing and erroneous data, Rose and Vaughan revealed the data for Venus to be inherently consistent. "... this phrase meant 'year of the golden throne' ... a year-formula that had been used to refer to the eighth year of the reign of Ammizaduga [what an amazing coincidence], the next-to-last king during the first Babylonian dynasty [circa 1500 or 1900 BC]. ... it is located in the space that would originally have contained the rest of the observational material for the eighth year [the 9th year as shown on my tabulations]. As it is now, we have only the date of Venus's disappearance [in the east], not the interval of invisibility and not the data of reappearance [in the west]." The tablets are at times dismissed as "omen tablets" because the data for each year are annotated with what is thought to be omen information, like "... and there is war in the east" or, "the harvest is good." But omens traditionally read as "if-then phrases," like, "if earthquakes last all day, then there will be destruction in the land." The Venus Tablets do not read like this. 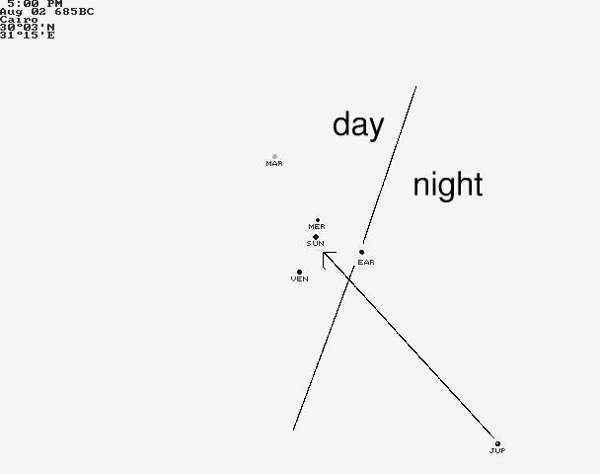 Of course there are also problems distinguishing tenses, but the few I have seen read like contemporaneous observations. Separate tablets have small errors of a day or so between them, as if we are looking at a collation of separate observations. But the tablets had to be important. They may have been used in a scribal school, which generally copied only important documents. And they are unique. No other planets were observed closely at that time. The movements of Venus must have been regarded as very significant. The Tablets of Ammizaduga have been investigated and discussed in archaeological and astronomical literature repeatedly since AD 1865. A number of these studies held that the data was in error, or suggested that it was made up. The studies all assumed that the orbits of Venus and Earth were nearly perfect circles in the past, as they are today. From 1974 through 1980 the tablets were investigated again by Lynn Rose and Raymond Vaughan, but without the bias of academic astronomy which, over a century of investigations, had simply removed data which did not fit (variously reported on in Kronos in 1980). Rose and Vaughan hold the data to be from the eighth century BC, not from the reign of Ammizaduga nearly a thousand years earlier as had previously been assumed, although exact dates were not determined. (However, I did determine the exact dates, for which see further below.) Rose and Vaughan used the fact that the orbits of Venus and Earth did not intersect. This was an unneeded assumption based on the "collision" of planets proposed by Velikovsky in Worlds in Collision which could be dropped. Schiaparelli in 1906 also dated the tablets to the 8th century BC, but based on mention of an invading Asiatic tribe which could be dated to the eighth century BC. What Rose and Vaughan did was to normalize the data with respect to planetary orbital eccentricities. (Eccentricity is a measure of how much an orbit deviates from the circular.) That process removed the variations in actual day counts, yielding dimensionless units related to planetary eccentricities. In "normalized" form, the data tells very little about actual orbits, but it does tell of changes in eccentricities, and changes in perihelion. There is a change in the perihelion of the Earth's orbit after year 9 (year 10 and later), and a rather radical change in the eccentricity of Earth (from 0.10 to 0.0) after year 19. I think the tablets record planetary events following the destruction of the temple of Marduk at Babylon in 689 BC, and its subsequent restoration in 680 BC. To point up the disruptions of the seventh century, Velikovsky had written that Babylon "did not celebrate New Year's day for a twenty year period" from 687 BC to 669 or 667 BC. "Eight years under Sennacherib, twelve years under Esarhaddon," Velikovsky quoted from the records from Nineveh, a sum of twenty years. He fit this period to what he thought to be the Earth shock of 687 BC as the starting date and the death of Esarhaddon in 668 BC as the end date -- also a difference of twenty years. However, it adds up to 21 years if different end points are counted -- 689 BC, the destruction of the temple at Babylon, instead of 687 BC (the second shock to Earth), through 668 BC, the crowning of a new king of Babylon. Velikovsky never connected the 20-year hiatus of New Year celebrations with the 21-year record of the Venus tablets which he had quoted earlier in his book. Additionally, Velikovsky does not mention that Babylon, occupied by Elam, was destroyed under an Assyrian siege in 689 BC, the temple compounds at the center were razed and left unoccupied for eight years, and not rebuilt until 680 BC. No wonder there were no New Year celebrations. In about 695 BC, Sennacherib, king of Assyria, who later lost an army in the siege of Jerusalem (686 BC), had attacked the kingdom of Elam on the Persian Gulf, by sending ships and troops down the Tigris river from Syria. Elam, although an Iranian nation, at that time held most of Babylonia (Mesopotamia) from south of the city of Babylon to the Persian Gulf. Elam struck back with an overland expedition which took the city of Babylon from Assyrian control. By 693 BC the Assyrian army had made its way back north to Assyria, having defeated the Elamites (in six campaigns) throughout Babylonia, except for the city of Babylon. Sennacherib spent the next 4 years on other punitive expeditions throughout the Assyrian empire, and finally in 689 attacked Babylon, then still held by the Elamites. Babylon was taken and sacked. Some 60,000 lives were lost in the siege, according to the records of Sennacherib. The city fortifications were destroyed and the temple compounds leveled. The God Marduk was removed to Ashur in Assyria. A canal off the Euphrates was rerouted to flood the central area of the city. The center of Babylon, where the temple had been, stood empty for eight years. Babylon had become important a thousand years earlier, in the time of Hammurabi (circa 1700 BC, in revised chronology), and, although at different times it was under the rule of different tribes, Babylon represented all of Mesopotamia. The whole region, once known as Akkad and Sumer, had become known as "Babylonia." The city God of Babylon, Marduk, had become the "King of the Gods," replacing the much older Mesopotamian God Enlil of Nippur as the region-wide God who would approve kingships and settle border disputes. Marduk had originally been a god of thunder and lightning, and can be identified with Jupiter. Kingship in Mesopotamia had been secular since the very beginning and the concept of a "King of the Gods" was an attempt by the priesthood to impose some control over the city-states of Mesopotamia and their individual kings. The priests of Enlil at Nippur had attempted to gain control over the kings of the individual cities at an earlier time. When Hammurabi unified the country after circa 1700 BC and made Babylon the most important city, the priests again saw an opening. They elevated Marduk to the status of a region-wide God and wrote a new creation epic, the Enuma Elish, around the exploits of Marduk -- based on the celestial events of 2349 BC (the fall of the Absu). At the time of Sennacherib, Marduk had been the primary God of Mesopotamia for a thousand years. He was recognized throughout Babylonian Mesopotamia, in Elam in the south, and even in Assyria in the north. Even later, Cyrus, the Persian, paid homage to Marduk when he took Babylon in 539 BC. All the Gods of Mesopotamia came to Babylon ("The Gate of the Gods") to honor Marduk, reminiscent of the state councils often employed by the earlier earthly kings of Sumer and Akkad. The Enuma Elish related this new theogony, with Marduk even elevated as Creator God. On New Year's day (Spring Equinox) the Enuma Elish was recited at the temple of Marduk. The celebration of New Year was the most important festival of Babylon, in which the king himself participated, playing the role of Marduk. Sennacherib's very long struggle against the Elamites, and his failures at Jerusalem three years later, added to his growing unpopularity among the Assyrians. His kingdom apparently suffered from crop failures also. His removal of Marduk from Babylon was seen as the cause of his misfortunes. "Even many Assyrians were indignant at this, believing that the Babylonian God Marduk must be grievously offended at the destruction of the temple and the carrying off of his image." Attempts were made by the Assyrian court to rewrite the Enuma Elish to show Marduk at fault. The politics came to a head in 681 BC. There was a revolt and Sennacherib was killed by two of his sons. The two sons had to flee the country and were pursued by Esarhaddon, the son of Sennacherib's surviving wife. He was subsequently crowned as King. Esarhaddon spends the remainder of his reign maintaining his father's kingdom. He worried much about his failing health and, at times of impending lunar eclipses, installed temporary substitute kings of Assyria so the Gods could not find him. Esarhaddon died in 669 BC while on a punitive expedition to Egypt, which was then again in revolt. There is a remarkable coincidence between the 21 years of observations recorded by the Venus Tablets of Ammizaduga and the 21 years without a New Year celebration in Babylon. If we place the end points of the 21 year record at the beginning and end of the period when no New Year celebrations happen in Babylon, then the year of "The Golden Throne" falls in 680 BC, the year the temple of Marduk was rebuilt. "After the ... [missing text] ... of kingship had descended from heaven, after the exalted crown and throne of kingship had descended from heaven, the divine rites and the exalted powers were perfected, the bricks of the cities were laid in holy places ... "etc. -- Ziudsura tablets, segment B, (some parts missing) circa 2700 BC. To the Babylonians the rebuilding of the temple of Marduk must have seemed like the "Kingship of God" had again descended to Earth, and in the same manner as at the beginning of time. Most likely the Venus data was compiled to these tablets for the sole purpose of declaring how the "Kingship of God" had returned to Babylon by the will of the Gods. The data for Venus was used because the sudden blazing of Venus in 680 BC (astronomical year -685) clearly declared the event. The beginning point of the Venus Tablets follows the destruction of the temple precincts by Sennacherib in 689 BC. A central panel which recorded the phrase "The Golden Throne" corresponds to the rebuilding of the temple in 680 BC. The end point of the data follows the coronation of Shamash-shum-ukin as king of Babylon in 668 BC following the return of Marduk. What was the year of the Golden Throne like? The account from Mesoamerica, that Quetzalcoatl "set himself on fire," suggests an absolutely astounding sight. After having set in the east early in the year and a month late (I'm not certain what calendar month), as noted by Rose and Vaughan, Venus became visible after having passed from behind the Sun and started to appear in the day sky, following the Sun across the sky for some 60 days, blazing for 40 days, together with Mercury which suddenly became visible in the daytime sky. It was as if Venus was on fire, an apparition as bright as the Sun, climbing up with the Sun on rising in the east, blazing through the day skies, initially trailing the Sun and progressively moving away from the Sun, until it "lit up the western night sky" at dusk after the Sun had set. Normally after disappearing in front of the Sun in the west, Venus remains out of view, caught in the glare of the Sun, for about 8 days. After disappearing behind the Sun in the east, however, Venus remains invisible for an extended period of time. This is both because of a longer path it has to travel behind the Sun, and because the Earth keeps moving, making the disappearance even longer. Today Venus remains hidden for about 50 days (it varies somewhat with the inclination of its orbit). At the time of the Venus Tablets of Ammizaduga it varied wildly and inexplicably. Velikovsky quotes some figures from the Venus Tablets which range from 2 months to 9 months. Even the passage in front of the Sun is at times far too long. But, with both the Earth and Venus on elliptical orbits, this is to be expected. Under the concept that the orbits of Earth and Venus were the same in the 7th century BC as today, this becomes inexplicable. Records from Hindu sources apparently concerning the same dates show the same inexplicable variation -- the Panchasiddhantika tables, transcribed 200 years later and published in AD 600. There are Egyptian data also concerning the changes in the sky (the Ramesside Star Tables). Today Venus is on a nearly circular orbit. We do not know when the orbit changed, for over the next 1000 years, the Babylonians had stopped looking, the Europeans had no interest, and the Arabs had not started observations yet. Only in Mesoamerica were observations made. These show up in the Maya Dresden Codex, a 13th-century AD document which uses observational values dating to AD 700. The Dresden Codex lists the disappearance of Venus behind the Sun as lasting 90 days, not the 50 days of today. It is thought that Isaiah is addressing Venus (Lucifer) as a self-willed animate phenomenon. But it seems much more likely that he is addressing Mercury, "son of the morning," as Hesiod also called Mercury, even though this condition (of being the son of Dawn) was only a year old in 685 BC. His text recognizes that the apparition rose high in the sky (as also noted by other sources) and expresses his contempt for a spirit who would rival God by setting up a throne above the stars. These lines would have been written after 680 BC (in Eastern Mediterranean chronology). I should add a note about the "Golden Throne." A "throne" in antiquity is not the high-backed armchair we think of. It is, after all, a coma and plasma tail we are looking at. It would perhaps look like the presentation of the mountain of Horus between 3100 BC and 2700 BC -- a vertical section of a truncated cone in profile and perhaps with distinct legs, depending on how the Sun illuminated the coma and the plasma outpouring. Because Venus or Mercury orbits between the Earth and the Sun, for part of the time when either appeared close to the Sun, the plasma tail would be directed toward Earth and foreshortened, and the planet with its plasma would have looked more like an inverted bucket than a blazing ball with a tail stretching halfway across the sky. The rationalization of the image, of course, depends entirely on expectations. Once you see a throne in the celestial display, it will remain a throne through any amount of distortion. "We sacrifice unto Tishtrya, the bright and glorious star who from the shining east moves along his long winding path, along the path made by the Gods." The description matches what we would expect. 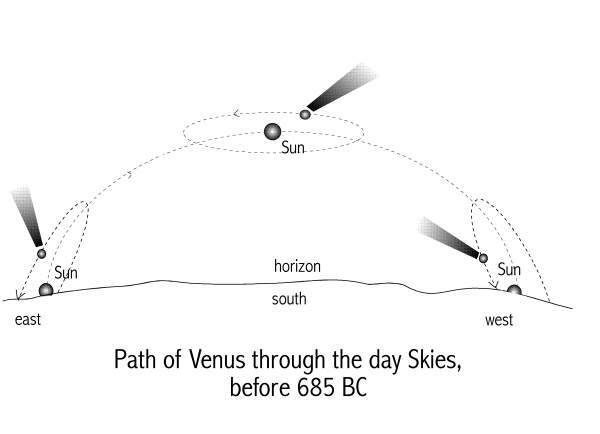 At this time, when Venus was still regularly seen in the daytime skies, the "long winding path" describes the loop traveled by Venus around the Sun in the daytime. This would loop and advance to the west over the course of some months. It is "long" because Venus extends some 40 degrees from the Sun as seen from Earth. The "path made by the Gods" is of course the ecliptic. Despite the "winding path" Venus stayed mostly near the ecliptic. "... who is clothed with fire and bears aloft a crown of awful splendor, raining fire over Arabia." The "raining fire" is noted in a number of other contemporaneous and later sources. It is the "Ignis Coelis" which will continue to fall sporadically on regions of Earth far into the future. "... he made a huge pile of wood in his palace court and set it on fire, which burned himself, his concubines, his eunuchs and all his riches. The palace itself was also burned to ashes." Croesus is reputed to also have been burned to death when Sardis was taken by Cyrus in 546 BC, although Herodotus has it that he was taken prisoner by the Persians. As always, a touch of the supernatural is added to history. I have not found earlier instances of this, except as detailed below. In China the last emperor of the Shang dynasty is said to have similarly set himself on fire. The Shang ends in 1125 BC, but the report is from the Chou dynasty, and may be apocryphal, in which case I would presume it was created by the Chi or Eastern Chou, and dated after the eighth century BC, when extensive historical records first appear. Having established the year of these events (-685 astronomical), I should at this point indicate the likely dates, the sources for which I will discuss in the next chapter in more detail. The following seems the most likely sequence of events for the year 685 BC. I'll embellish the chronology with some quotations from various sources, which I will cover in more detail later. On June 15 (Gregorian equivalent) the Sun went into high activity, for a one-and-a-half-month-long series of continual Coronal Mass Ejections (CMEs), hurling billions of tons of material, mostly as protons, into the surrounding space. It caused unusual auroras on Earth, would reinstate the polar plasma columns, but would not change its orbit, except that the polar axis would start to incline to a different value. On June 15 the Olmecs note that the Sun was not setting in the proper location. "It changed its path," states the Chilam Balam. This condition would last for some 40 days, through July 25th. On June 15, a day of the new Moon, Venus and Mercury, located close together in the sky and east of the Sun and Moon, started to blaze like suns. "Two suns were seen battling in the sky," China records. Franz Xavier Kugler, interpreting the Sibylline Oracle Books of AD 115, which retells the same display seen in the skies (but written about 800 years later), assumes the Earth was met with two large blazing comets. Since Mercury was likely invisible in the daylight sky until it also started to blaze like Venus, it looked as if Venus gave birth to Mercury, who is called Phaethon in the Eastern Mediterranean. Because of the spikes of flames reaching across the sky, and with a later knowledge that Phaethon was the planet Mercury, Roman philosophers later developed a theory that comets are produced when two planets clash in the sky. In the Guatemalan Popol Vuh, Hunahpu and Xbalanque, Venus and Mercury, sacrifice themselves in order to defeat the lords of the Underworld, and start creation. "Watch! they said, then they faced each other. They grabbed each other by the hands and went head first into the oven." It is this phrasing from the Popol Vuh which allowed me to pinpoint the starting date of this event. Dennis Tedlock, translator of the Popol Vuh, inadvertently pointed this out when he proposed that there should be a relationship between Hunahpu and Xbalanque and the Sun and Moon. Immediately after June 15, Mercury, on a much smaller orbit than Venus, starts to reapproach the Sun, and passes above the Sun and on toward its west side on about July 9th. The Sibylline Oracle Books recall the movements of the Sun and the two planets during the 40-day period. I'll discuss this in the chapter "The Sibylline Star Wars." On July 14th Jupiter responded with a return lightning stroke, directed at the Sun. A massive plasmoid was released, seen and recorded worldwide. Its travel was followed for 11 days. Asia and Europe saw the plasmoid as it was approaching. The people of the Americas got a full broadside view of the plasmoid as it passed by Earth at a distance of some 30 million miles (48 million km). On July 25th the plasmoid hit the Sun. The people of the Eastern Mediterranean saw the plasmoid again after it had passed by Earth but only saw it in the early morning (two days later), saw the east horizon light up as it landed at the Sun, and assumed that Mercury (Phaethon), which preceded the Sun in rising, had been hit -- or that Venus was the target. Mesoamerica saw nothing of the final splashdown, and assumed that the lightning bolt was meant for Mars, the nemesis during this period, located just west of the Sun in the sky. But here, too, some opinions held that Venus had been hit. The lightning bolt from Jupiter was, as I will show below, 1.5 million miles (2.4 million km) in diameter -- twice the width of the Sun -- and 15 million miles (24 million km) long. It would have taken some 9 hours to complete the landing at the Sun. It would have lit up both the day and night sky. The Popol Vuh suggests that the planets near the Sun, Venus and Mercury, were not seen for the next four days. The Popol Vuh relates that Hunahpu and Xbalanque, after they jump in the oven of the Xibalbans, are seen by people as catfish in the river where their ashes were deposited. The river is the ecliptic, which was still aglow certainly at this time (it lasted to AD 1840). They "looked like catfish." These are likely the lesser bolts from Jupiter. As will be recalled from the narrative of Egyptian predynastic history, catfish is an apt description for a plasmoid. When I first came to a realization of the above events, I simply could not believe it, and was reluctant to put together this narrative. It is absolutely unimaginable that a planet could have bolted its star with an electric arc which had to travel 480,000,000 miles (773,000,000 km) to reach its destination. I was familiar with the plasmoid imagery of Rome and Babylon, as well as the numerous "model plasmoids" in Asia, shown in Thunderbolts of the Gods (2005) by David Talbott and Wallace Thornhill. The plasmoids are depicted on coins also. These images were all from late antiquity, none from before 650 BC. That was a troubling fact, for the previous depiction of a plasmoid was nearly 3000 years earlier, the predynastic Egyptian king "Catfish-drill." I was also familiar with the "rigid bar" insignia of Maya rulers in the Classical Era (AD 400 to AD 900), but it was only when I started to look at the iconography of the Olmec site of La Venta, which can clearly be dated to before 650 BC, that I was forced to accept the fact that I was obviously looking at a depiction of Jupiter in glow mode plasma discharge (easily recognizable because of Jupiter's reversed magnetic field), and a massive plasmoid lightning bolt shaped exactly like the classical laboratory forms. The sculpted or engraved god-figure is holding the plasmoid in his arms, as all later chiefs among the Maya will also. At La Venta the first pyramid of Mesoamerica was constructed, called a "red mountain." It is an image which reflects the contemporaneous form seen in the sky at its period of creation and which recalls the much earlier celestial mountain form from thousands of years earlier. The diverse imagery suddenly came together to explain the connection between what the Greeks considered the "mythological past" and what they and we consider the "modern world." The plasma bolt launched from Jupiter is the "lightning bolt of Zeus" which toppled Phaethon from his father's chariot. The myth of Phaethon is thus the last "mythology" from antiquity. In 685 BC, before releasing the plasmoid, Jupiter must have expanded and again assumed the size of a mountain. The bolt traveled over 480 million miles to the Sun. It is little wonder that Jupiter, despite its diminished visual display since 2150 BC, continued to be held as the chief God everywhere in the world. We have to ask how this could have happened. What would normally happen to cause lightning between planets, is that a conductive path has to pre-exist and that the voltage difference has to be sensed. That would happen if the plasmaspheres of two planets touched. Although the existence of a long tail would have furnished the electric path for a return lightning strike, it is just not likely that the plasmasphere tail of Venus (or Earth) would have reached 500 million miles (800 million km) into space, through the Asteroid Belt, to Jupiter. But there is an entirely different condition which fulfills the need for a conductive media between Jupiter and the Sun, and for sensing the voltage difference. It already was my suspicion that the "Venus nova event" was in actuality a month-long coronal mass ejection of the Sun. It lit up Venus and Mercury like suns. It was at this time that both planets ended up becoming pockmarked with craters and electric scars. It altered the spin axis of the Earth. And it provided a highly conductive path between the Sun and the far reaches of space, certainly to the location of Jupiter -- a distance of 5.2 AU. A continuous plasma expulsion of the Sun would extend the high-voltage inversion layer which is normally relatively close to the Sun, far out into space. Rather than having to breach 500 million miles (800 million km) of a very large voltage difference, Jupiter was suddenly in almost direct electric contact with the Sun. The voltage difference between Jupiter and the Sun would be sensed by the plasmasphere of Jupiter which, like those of the other planets, actually travels within the plasmasphere of the Sun. Earth, Venus, and Mercury were not involved in the bolt from Jupiter. Earth and Venus remained invisible to Jupiter, protected by their own plasmaspheres. Earth and Venus were also well away from the line of fire. Scaled from the diagram above, it would appear that Earth was some 30 or 40 million miles (48 or 64 million km) from the path of the lightning bolt (at a right angle). The plasmoid from Jupiter aimed directly at the Sun. The people of Earth witnessed the travel of the plasmoid through the night and daytime skies. Even if the bolt was only 1/10th of the diameter of Jupiter, it would have been the diameter of the Earth. In November of AD 2003 the Sun sent a number of Coronal Mass Ejections (CMEs) into space. These usually travel at a speed of about 2 million miles per hour (3 million km per hr) by the time they reach the Earth's orbit (as does the Solar Wind). The CMEs of 2003 traveled across the 93 million miles (150 million km) between the Sun and Earth in 30 minutes, averaging 200 million miles per hour (320 million km per hr) -- a quarter of the speed of light. There is no reason to believe that the lightning bolt from Jupiter in 685 BC could not have traveled at a wide range of possible speeds. I'll make a speed and time estimate further below. 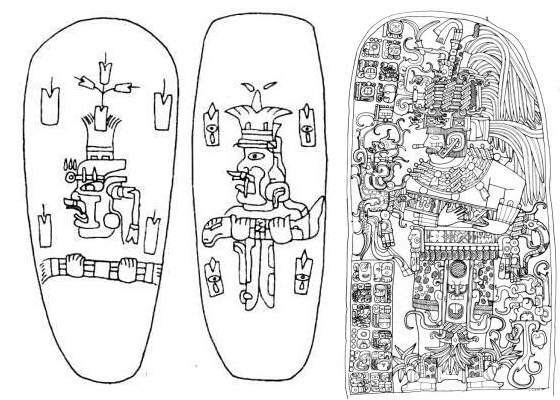 The plasmoids depicted in Mesoamerica are therefore much longer than the short hand-held objects depicted in Asia, or the medium sized "thunderbolts" shown in graphics and statuary in the Mediterranean region. The Mesoamerican plasmoid is depicted as carried in the arms of persons and looks to be a five- or six-foot long object. 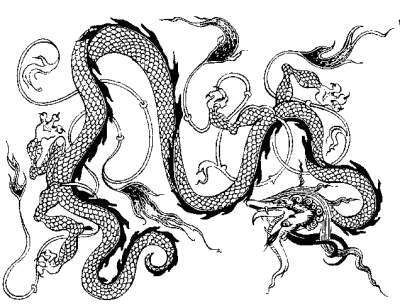 China earlier, in 2349 BC, had understood plasmoids as dragons approaching from the east, and records dragons in exactly the manner in which the plasmoid was seen in the sky, head first, with an open mouth, long feelers attached to the mouthparts, and what looked like legs attached further away along the body. Mesoamerica also recorded a dragon, but it had no legs. Instead it had heads at both ends of the body, but also with the wide-open mouth and the tendrils attached to the mouth parts as in China. What was understood as rear legs in China, was properly attached parts of the rear mouth of the dragons of the Maya. Mesoamerican chiefs carry a rigid bar in their arms as an emblem of office, with triple tines at both ends. A bar like this is first shown held by a person (actually the God Jupiter) on stela 2 of La Venta and on a number of engraved dedicatory celts at the same location and period. 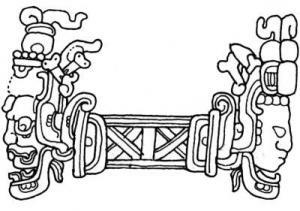 By the time of the Classical Maya (AD 400 to AD 900), the bar is four times as thick as in Olmec times of 650 BC, and it is conceived of as a tube, a rigid snake, or a dragon with a head at each end. The tines have become mouth and jaw parts of the dragon, and Venus and the Sun are shown emerging from the two mouths. Short hand-held "model" plasmoids, dating from this era, are found today in Tibet, India, and Japan, nearly identical to European sculptural and mural depictions, but shorter. All of them mostly follow the shape of laboratory plasma discharges: a twisted body with balls at both ends, from which emerge three tines like flower petals. The same triple-tined objects with a twisted center are shown as being held in the hand of Zeus in Roman statues. The trident arrow appears (as the weapon of Marduk) in wall sculptures in Mesopotamia after 600 BC. The Roman naturalist Pliny, in the first century AD, still discusses lightning bolts from planets, and distinguishes between various types. If the plasmoids had last been seen shortly after the end of the "Era of the Gods" in circa 3100 BC, it would have been unlikely to suddenly reappear in philosophical discussions during the last few centuries of the previous era to become the object of speculation. It seems clear that the difference in the images between Asia, Europe, and the Americas is entirely due to seeing this object in different stages of its travel. If Mesoamerica saw the plasmoid bolt in the day sky (with Asia and Europe turned away to the night side of Earth) just as it passed Earth, then the bolt would have been seen in full profile. From this the size can be estimated. I would suggest that, as seen from Mesoamerica, it probably subtended an angle of about 30 degrees in the sky -- understood as a five- or six-foot long object held by a God. With the Earth 30 million miles (48 million km) from the path of travel of the plasmoid, it must have been about 15 million miles long (24 million km) (30,000,000 * sin(30) = 15,000,000 miles). In early depictions in Mesoamerica the object looks to have a diameter of about 1/10th of its length. That would make the lightning bolt 1.5 to 2 million miles (2.5 to 3 million km) in diameter. This is certainly larger by far than the diameter of the planet Jupiter (80,000 miles; 129,000 km), but the plasmasphere of Jupiter, under normal conditions, is on the order of 40 planet diameters, thus 3.2 million miles (5 million km) wide. Plasmoids also tend to shorten on cutting loose from their cathode, and thus thicken. Mesopotamia and the Eastern Mediterranean saw the plasmoid again as Earth turned back to the day side, but the plasmoid had passed by. Mesopotamia possibly saw the plasmoid contact the Sun (it would have caused a stupendous brightening in the eastern sky). Mesoamerica probably never saw the plasmoid reach the Sun, which would have required another 30 million miles (48 million km) of travel (about a day of travel), but assumed it was destined for Mars, which stood in the sky just past the Sun in the west (and would rise before the Sun the next day, obscured by the light of the impact). From these rough estimates it could be suggested that the plasmoid was traveling at a rate of about 20 to 30 million miles per half day -- or 1.5 to 2.5 million miles per hour (2.5 to 4 million km per hr). These estimates are in line with what we know of the solar wind and normal CMEs traveling from the Sun. How long did it take to travel from Jupiter to the Sun? Assuming that the gradient of the electric field between Jupiter and the Sun was low enough that acceleration during travel could be neglected, and at an average rate of 1.5 to 2.5 million miles per hour, it would take 8 to 13 days. and (5.2 * AU) / (1500000 * 24) = 13.4 days. The people of Mesoamerica seem to claim it took 12 days. It would thus have been traveling at a rate of 5.2 * AU /12 = 40,000,000 miles per day -- 1.66 million miles per hour. During much of the ninth century and a portion of the eighth and seventh century BC (806 BC to 685 BC) the skies of Earth were crowded with unwanted planets. Then, after 685 BC (680 BC in Eastern Mediterranean chronology), they all disappeared. Venus, without a magnetic field, would not likely have produced the tri-lobed plumed headdress shape, but only the tail of its surrounding coma, directed away from the Sun, plus a tail of sputtered particles which would split into two parts. This is seen in comets today (which also do not have a magnetic field). Additionally there might have been long wisps of plasma from its polar regions. These would seem to be coherent plasma streams, bent to the direction of the Sun, but not organized into tri-lobed plumes. In 685 BC Venus brightened enormously, and all of these features, which had been seen for ages, suddenly increased in intensity. Assurbanipal described Ishtar (Venus) as "... who is clothed with fire and bears aloft a crown of awful splendor." I suspect that Venus lost its tail and perhaps much of its coma, because some time after 685 BC Venus was admitted as a planet in the astronomy of Babylon -- it had started to behave like a planet. A hundred years later much had been forgotten. No one remembered, or wanted to remember. History was turned into mythology. The tri-lobed plasma formation, described above, would appear at the poles of a planet with a magnetic field when in glow mode plasma discharge. Jupiter did this in 685 BC. Jupiter has a very strong, but reversed, magnetic field (ten times that of any other planet), and it produced a three-lobed flower form extending from its north pole above the coma surrounding the planet. The surrounding coma probably looked the size of the Moon. 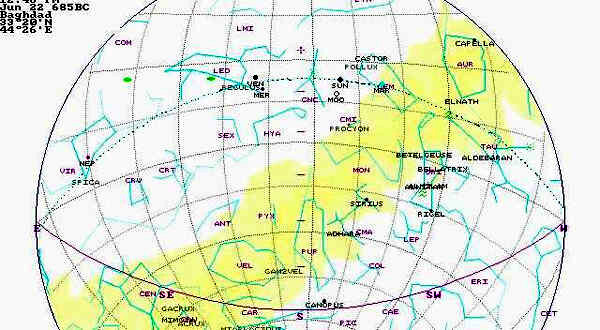 The same strong magnetic field produced another tri-lobed form, but much larger than the top, at its south geographical pole (the north magnetic pole), making it look as the "body" of the planet, or as a mountain, although, and as noted by the Olmecs, the body looked like the open jaws of a crocodile, the central tongue of which might have been missing or not observed. Crocodiles have only a short tongue. Jupiter in this condition was also identified as the central (or southern) tree of creation, the World Tree of the Maya. 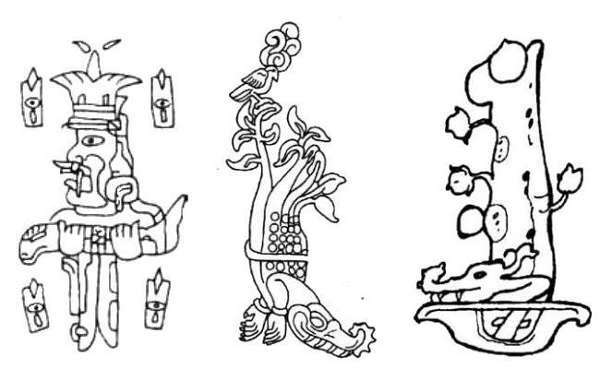 The same World Tree is often shown by the Maya with branches and leaves at the top, but with the head of a crocodile as its base at the bottom. The tri-lobed crown of Jupiter waved back and forth, since the magnetic poles of planets do not coincide with the rotational axis. At a rotational rate of 9 hours, the rotation of Jupiter's tri-lobed plasma outpouring would have been seen as a plant waving in the wind. Jupiter was probably also seen during the day. At Teotihuacan the favored headdress of dignitaries and Gods becomes a hat of feathers and plumes. This fashion carried through for a thousand years to the Maya and the Aztecs. In the Eastern Mediterranean region the Gods had already taken human form, and the only strange animals depicted as supernatural beings are the demons they battle. In Mesoamerica Mars is often depicted as "smoking" (a cigar) or with a smoking mirror on his forehead. As I have mentioned earlier, the smoking mirror is likely the sublimation of water from the remnant upper ocean. This suggests that at some point in time Mars had lost its atmosphere, but had retained one of its oceans (the smaller ocean is within the confines of the larger polar ocean). The smoking cigar might be an unshaped plasma discharge, or a plume of impinging electrons brought to arc mode near Mars's surface. But one wonders if the "smoking" represents the lightning bolt suspected to have been delivered by Venus in 776 BC. When Mars is depicted with an axe piercing his forehead, recognition has to be given to some gigantic impact of the past -- probably the thunderbolt excavation of Valles Marineris. Olmec sculptures depict Mars with the features of a bat and the snarl of a Jaguar, which might be additional aspects of dust lifted from the surface and shaped by the Earth's magnetic field (when Mars closed in on Earth). At later times among the Maya, Mars (God K), is depicted with the leg of a snake, which archaeologists have determined is a symbol for lightning. That describes the effect of electric contacts after 806 BC. An estimate of the number of visits by Mars after 747 BC might be deduced from the religious monuments at Olmec La Venta between 747 BC to about 400 BC. There are, within the confines of the pyramid and adjacent plazas, five elaborate graves (one of the graves is a coffin shaped as a gigantic cayman), five massive offering caches of serpentine blocks, and four colossal stone heads. The first passage of Mars perhaps did not require a stone head. Or it has not yet been found. The three mosaic tiled floors (two were buried) read "9 Jaguar" -- a bar and 4 dots, shaped like a jaguar face with the characteristic forehead cleft -- which in effect equates to the name used in the Chilam Balam for Mars, Bolon Dzacab, "Nine Lives." Except for this repetition of five, along with the four giant heads, there is no clear record of the number of visits. The only additional suggestion comes from the Chilam Balam, which records, after the first mention of the appearance of Bolon Dzacab, Mars, in 747 BC, the descent of four "mighty demon bats." 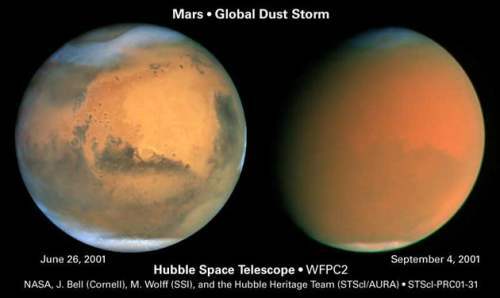 The best reconstruction by Velikovsky from Biblical sources was to suggest appearances of Mars at 15-year intervals. The 60-year time span of 747 BC to 687 BC represents five visits if they were 15 years apart. This is also the sequence of events in the Quiche Maya Popol Vuh -- five ballgames are played in the underworld. However, the number of visits at 15-year intervals between 806 BC and 687 BC is nine. Despite the coincidence of "nine" in "Nine Lives" and the suggested number of close contacts by Mars, the certainty for the number nine comes from the name of the flower vendor, Bolon Mayel [Nine Fragrances], who is Mercury, and who is said to have accompanied Mars in each instance. The Chilam Balam lists nine close calls by a planet named Nine Fragrances in the eighth and seventh century BC (probably from 806 BC to 687 BC), described as delivering flowers and fragrances. If these were being delivered by Mars, then the "flowers" are curious, because a flower-form (the tri-lobe form) would not be expected for Mars. Nor would the fragrances, for Mars has no atmosphere. This would suggest that the planet called "Nine Fragrances" was Mercury, instead. Mercury has a minor magnetic field, and still has a strange mix of gases as a thin atmosphere. When the Popol Vuh describes the northern Gods after 10,900 BC, Mercury was confused with the later appearance of Venus, and called "Sovereign Plumed Serpent." But very little atmosphere would be needed to create a coma in glow mode. The fragrances are recorded in Vedic sources also. Velikovsky mentions them, although he assigns them to the era of 1500 BC. The exterior of the plasmasphere of Mercury (the "double layer") would have included gases in ionized forms from its atmosphere. Close passes to Earth would have transferred many of these to Earth's plasmasphere, and eventually to the Earth's atmosphere. The repeated destructions of sites in Persia, the Middle East, Greece, Italy, and apparently Mesoamerica, together with the identification of Mars, and lamentations about the followers of Mars, would suggest Mars as the main agent of the destructions of the 8th century BC. But the flower forms and the associated fragrances point to Mercury. These are not even mentioned (except for the fragrances) in the Middle East. What I will suggest is that Mercury had been a companion of Mars since remote antiquity, so that the two would always appear together. I had already considered that Mercury was likely the "other planet" which showed up along with Horus/Mars in the period of 3067 to circa 2700 BC to constitute the twenty-some pharaohs of the first and second dynasty of Egypt and similarly the 20 early kings of Kish in Mesopotamia. The two planets show up along with the "Followers of Horus" and the large quantities of cattle and dead people in the skies which were recorded by the Egyptians in the first and second dynasty. I have also suggested that the "sandal bearer" shown following the pharaoh on the "Palette of Narmer" is not his son, but Mercury. The "Palette of Narmer" shows the "Followers of Horus" as six papyrus buds led out of the Duat by a nose rope held by Horus the falcon. On the obverse side are the standards of the cardinal directions, followed by a woman with a bola, Narmer as Mars, and Mercury bringing up the rear. Of course it is not certain if Mercury always followed the travel of Mars. But at any rate in the 8th and 7th century Mercury would show up near Mars at each of the 9 instances when Mars cruised close to Earth on 15-year intervals. The 16th century AD Chilam Balam lists "Nine Fragrances" as he who descended when "it was that the word of Bolon Dzacab [Mars] descended to the tip of his tongue." "With it descended Bolon Mayel [Nine Fragrances]; sweet was his mouth and the tip of his tongue. Sweet were his brains." The "nine" of the "Nine Fragrances" represents, as these numeric prefixes do throughout the Chilam Balam, nine appearances of Mercury. This matches the nine appearances of Mars between 806 BC and 687 BC. By coincidence the nine appearances of Mars is the same number assigned to him before 3147 BC ("this first Bolon Dzacab"). Curiously, the giant jade or greenstone mask-shaped floors at Olmec La Venta, apparently buried as a means of warding off or appeasing Mars, represent the face of a Jaguar in the form of the glyph for "nine," were installed long before the nine close passes of Mars had been completed. The mouth, tongue, and brains (top of the head?) of Bolon Mayel probably describe the plasma plumes above and below Mercury, and are, as a matter of fact, described in the Chilam Balam as flowers. Today Mercury still has an externally induced magnetic field (it is thought), due to the fact that on its (current) orbit it travels to a distance twice as far from the Sun between perihelion and aphelion. Previous to the 7th century BC, traveling on an orbit which took it well beyond the orbit of Earth, it might have had a much greater magnetic field. Mercury also, gauging from the remaining thin atmosphere, might have held a considerable gaseous envelope, able to support a shaped plasma. The Earth, another planet with a magnetic field, would, at various times of excess electric activity, also have had the same tri-lobed vortexes standing above the Earth's north and south magnetic poles, and extending perhaps 10 or 20 Earth diameters into space. The plasma above the north magnetic pole would have been larger than the plasma of the south magnetic pole. But the southern plasma was most likely visible also in the northern hemisphere, for the plumes would have bent away from Earth into the tail of the magnetosphere. The combined appearances of Mercury and Mars came to an end in 686 BC, when a line-up with Mercury caused an Earth shock and Mercury was, as I have described, jolted into an orbit much closer to the Sun. The Earth changed the location of its aphelion, as Rose and Vaughan have pointed out (detailed below), inadvertently moving it away from the orbit of Mars. In fact, the mythological and quasi-historical tales from this era are obsessed with twin celestial Gods. With the Greeks they are the Dioscuri, Castor and Polydeuces (Pollux). Castor is a tamer of horses and mortal, Pollux is a boxer (no kidding!) and immortal. Homer places them in Sparta. The Spartans, in fact, hold them to be the younger twin brothers of Helen. (Homer's Helen in this may be equated with Venus.) Both travel with the Argonauts at one time. They steal cattle in Arcadia and drive them east to Sparta. At the conclusion of some fights and pursuits, Zeus kills one of the pursuers with a thunderbolt. This last represents the eruption of Venus and Mercury in 685 BC. In Italy the twins are the founding patrons of the city of Rome, Romulus and Remus, sons of Mars. This is strange, but then, Rome's historical records were destroyed in antiquity. Remus was killed by Romulus in a dispute. Romulus founded and ruled the city of Rome, and is then taken up into heaven. After 686 BC Mercury had, for all practical purposes, disappeared from the skies. The constellation Gemini is generally held to be the Dioscuri twins, but Hyginus (in Astronomica, attributed to Hyginus, but dated circa AD 200) says the twins are Apollo and Heracles (Mercury and Mars). Santillana and von Dechend mention twin deities of China, and there are without doubt others. In the Popol Vuh two sets of twins are identified, first as One-Hunahpu and Seven-Hunahpu (probably an appearance of 776 BC), and then as Hunahpu and Xbalanque (the five appearances documented in the Long Count for 747 BC and after). Talbott, in The Saturn Myth, notes that almost always one of the twins is white and the other is black. He references not only Greek sources, but also Mesoamerican, Indian, Chinese, and many others. Australia could be added, as well as the New Testament apostles James and John -- the Sons of Thunder (Mark 3:17). We could add Cain and Able as an earlier manifestation. Talbott, of course, relates the black and white aspects of the celestial twins back to the polar configuration in the north. But it should be obvious that the white twin is Mercury with a cloud cover of an extensive atmosphere, and the black twin is the dark Mars, with neither an atmosphere nor a coma except as wings of dust. The two planets only became prominent in the skies of Earth when their orbits intersected the orbit of Earth periodically. This happened in the 8th and 7th century BC, as had happened for a period, 2200 and 1100 years earlier, after 3067 BC and again after 1935 BC. Before that, during the "Era of the Gods," only Mars interacted with Earth. Mercury hung below Saturn, initially very visible when Saturn was blazing, and probably mostly obscured after Saturn quieted down. Despite the fact that Mercury is the smallest planet of the Solar System today (our Moon is smaller), it supported an atmosphere and a coma, which would have made its apparent size much larger than Mars. Together these two would have constituted the iris and pupil of a huge celestial eye. There is another very interesting and related consideration arising from the analysis by Rose and Vaughan. They note a change in the aphelion of Earth's orbit in the year immediately following the year of the "Golden Throne" of 685 BC, thus 684 BC. The orbit of the Earth changed its shape, or as Rose and Vaughan note, the Earth's aphelion moved elsewhere in its orbit by 10 or 15 degrees. Probably the most important aspect of the change in aphelion is the fact that it immediately removed the Earth's orbit from further intersections with Mars's orbit, by rotating away from the location where it crossed Mars's orbit. Moving aphelion by 10 or 15 degrees within the time of a single rotation around the Sun is not a small amount. This clearly is in conflict with any current theories of how orbits might change, which could only happen under the gravitational effects of other planets. Such gravitational tugging is a very small percentage of the effect of the gravity due to the Sun, and would take millions of years to have any effect. What also happened simultaneously, as a result, was a change in the place in the heavens to which the axis of the Earth pointed. The result would amount to a 15-degree shift of the vernal equinox (the first day of spring, and the start of the year for most nations), and thus a 15-day delay in the start of spring. Instead of the Sun rising in the constellation of the Bull, Taurus, as it had for thousands of years, it suddenly started to rise in the constellation of the Ram, Aries. I'll detail this in the next chapter. It was as if a power outside the dome of the stars had suddenly shifted the heavens by rotating them away from the horned bull -- the age-old symbol of the celestial Gods. This was a power greater than that of any of the Gods worshipped up to that time. It closed an era. Although the changes in the night sky were seen immediately, the significance of the change was not initially appreciated. But within a few hundred years this entered religious and philosophical thinking in the Middle East, India, and China. It is almost certain that Buddhism can trace its inspiration to this event of 685 BC. The Persian Zoroastrianism similarly dates from this period, and strongly influenced Judaism. In China the concepts are expressed in the philosophy of Taoism. The Tao proposes to explain "the change of the path." The "mystery religions" of the Middle East and Greece date from this period. I will get back to this topic in a following chapter. To explain the strange behavior of the planet Venus: Today Venus is mostly seen only at night, and never more than about 40 degrees alternately above the east or west horizon. Once the Sun rises, Venus is (generally) no longer seen. Venus is an inner planet. It revolves around the Sun between Earth and the Sun. Its path in the sky describes its orbit around the Sun. In antiquity Venus was seen also in the day skies (today also, but infrequently). During night hours it was seen preceding the Sun before rising (in the east), or appearing after the Sun set (in the west). In the west, in showing directly after sunset, it would distance from the Sun over the following days, that is, be seen higher in the west sky every day, and then start to come closer again, to suddenly disappear for 8 days, to then rise before the Sun in the east. In rising before the Sun, it would also slowly distance from the Sun and then return, to then disappear for some 60 days or more, after which it would again rise in the west. In antiquity, Venus was seen as a brilliant object near the Sun. It would seem to circle around the Sun, always with a tail pointing away from the location of the Sun. But it would disappear completely from the skies twice during its 584-day synodical period, once for 8 days, and once for 50 days as it passed in front of the Sun or behind it. These are the current values. In AD 700 the Maya recorded 90 days for the second value. Enuma Anu Enlil: An astrological omen series comprising some 68 tablets. The tablets themselves were found in the Assyrian king Assurbanipal's library in the ancient city of Nineveh, and were written in the 7th century BC. However, evidence suggests the collection of omens is much older than the tablets found in the library, and the original series probably dates back to the Old Babylonian period at the beginning of the 2nd millennium BC." "The Enuma Anu Enlil deals mostly with the constellations, or 'fixed' stars, and, to a lesser degree, with the planets. The exception to this is tablet 63, known as the 'Venus Tablet of Ammizaduga'.... Several copies of tablet 63 have been recovered in varying degrees of preservation, but a composite of these reveal the tablet to be a record of rising and setting dates for the planet Venus over a period of 21 years. As with Enuma Anu Enlil as a whole, the 'Venus Tablets' also contain omens." "If in month I the Demon with the Gaping Mouth (Cygnus) rises heliacally: for 5 years in Akkad at the command of Irra [Mars] there will be plague, but it will not affect cattle." The reference to Akkad places the above text to an era well before the era of Babylon or the third Assyrian empire. But by similar references to contemporary events, the Venus tablets themselves can be placed after the start of the 7th century BC. The data is not missing. Venus was not "observed to disappear" for nine months, which would have been from March through December. 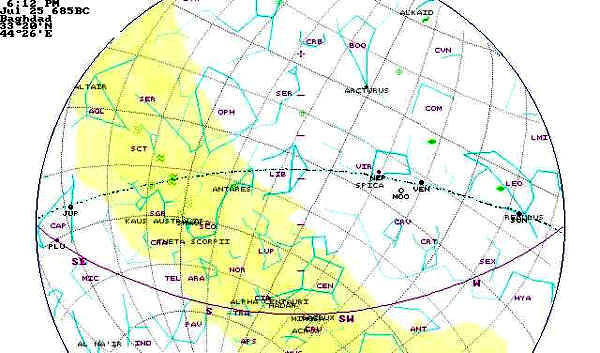 -- after Livio C. Stecchini, "The Twenty-One Years of Venus"
An ephemeris shows that rather than disappearing in front of the Sun in the west in 684 BC, Venus rode some 8 degrees above the Sun. Thus it moved from being seen in the west above the Sun, rather than in front of the Sun, to next being seen in the east, also above the Sun, without the disappearance period. This is a rare condition, and could be held as proof that the data does not belong in 1500 BC, but properly describes conditions in 684 BC as I have determined. An ephemeris can be used because the later changes in eccentricity do not change the location of Venus or Earth by more than a few days. Both Earth and Venus were on orbits very little different from today. Also, eccentricity does not change the orbital period. It was during the course of the previous year (685 BC, astronomical) that the planets Venus and Mercury blazed with light. Velikovsky, in Chapter 10 of Worlds in Collision, presents a listing of the anomalous spans of time that Venus was visible in the east or west, and the length of disappearances, as recorded by the Venus Tablets of Ammizaduga. Velikovsky uses this information to bolster the notion of an irregular orbit for Venus in 1500 BC. The Venus Tablets of Ammizaduga indeed prove that there was no regularity at all. But Velikovsky (or anyone) should have realized that if both the Earth and Venus were on eccentric orbits then this condition would be expected. Today Venus has the most circular orbit of any planet, and Earth nearly so, and the visibility and invisibility of Venus in the sky is thus very regular. I should also note that the idea of "visible in the east" and "visible in the west" is an erroneous notion, since in antiquity, because of its bright coma and tail, Venus moved visibly across the skies with the Sun in the daytime (in addition to showing at night after sunset or before sunrise). What was strange to our ancestors was that Venus would periodically disappear altogether -- in passing behind the Sun or in front of it. At these times the tail would shrink also and disappear, because the plasma tail would be either directed away from the Sun toward Earth or away from the Sun while behind. This strange behavior, in fact, is why Venus was watched. It was such a peculiar object that it was not classified as a planet until after 600 BC. Normalization involves dividing data points by an associated variable, which in effect removes its influence on the data. In this case the data could be investigated without having to know (for example) the synodic period of Venus or Earth. Normalization did not supply missing data, it only allowed Rose and Vaughan to test the data against various assigned eccentricities for Earth and Venus. The background and methods were detailed in a series of articles by Lynn Rose and Raymond Vaughan, the first of which appeared in Pensee in 1972 as "Babylonian Observations of Venus." This was followed by a number of articles in Kronos: "Analysis Of The Babylonian Observations Of Venus" (1976), "Ninsianna Update" (1980), and "Section II, The Artificial Insertion" (1980). In 1994 a summary of this analysis was presented at the "Kronia Conference" in Portland, Oregon. "When the family of the Babylonian kings died out, after 8 years of no kings, Esarhaddon the king of Assyria conquered them and held that kingdom for 13 years. (Ptolemy's, Can. Reg.) It appears Assaradinus is the same person as Esarhaddon. This is from the similarity in the names and by the word of the Holy Scripture. It intimates that he was king both of Assyria and Babylon at the same time. 2Ki 17:24 19:37"
Kingship in antiquity was not assumed arbitrarily. Kings were appointed by the Gods, and kingship stayed in a family. This was recognized even by the conquerors of a nation. Assurbanipal is the third son of Esarhaddon, and is installed as king of Assyria apparently through the intrigues of his grandmother (who was Sennacherib's surviving wife, a Canaanite princess), and selected as the most able of the three sons of Esarhaddon. By a proclamation in 672 BC, his father Esarhaddon, had ordered that on his death Assurbanipal should be crowned king of Assyria, and Shamash-shum-ukin as king of Babylon. Thus the (older) crown prince (installed in Babylon) was skipped over for kingship of Assyria. He, of course, revolts at a later date. Under Persian rule, after another revolt in Babylon, Xerxes melted down the statue of Marduk in 482 BC. When the historian Herodotus arrived in Babylon a generation later, he climbs the 360 stairs of the ziggurat to find the chapel at the top empty. The suggestions of a world-view for the Mesopotamians is developed in the chapter "Language and Causality," under a discussion of languages and their influence on the conceptual point of view of reality for a people. The story of the Assyrians and Babylon recounted here is an abbreviated version. For greater detail see the last chapter of H. W. F. Saggs, Babylonians (2000). A time-line of secular and celestial events in the 7th century BC follows. Data below are in Eastern Mediterranean chronology, and not corrected to astronomical dates. Thus 680 BC (below) will later be shown as 685 "BC" -- actually meaning -685. 8       680     9     Sennacherib's son Esarhaddon becomes king of Assyria. Babylon rebuilt -- "Year of the Golden Throne"
Note that the year of the Earth shock, 686 BC, falls in this period, but is not an instrumental part of the calculation. Except for the records detailed in the Chilam Balam, there are few sensible Mesoamerican details about Venus (Quetzalcoatl) in 685 BC, except notions that he set himself on fire and disappeared across the ocean on a raft of snakes. I could suggest that "the ocean" is the Absu here and the raft of snakes are seen near the equinox, similar to Scylla of the Odyssey -- except that the imagery is 1700 years late. It was more important to the people of Central America to have received the promise made by Quetzalcoatl to return and set things right. It was another salvation religion introduced to the world. "An outstanding problem with the analysis is the eastern disappearance [of Venus] on the twenty-fifth day of the twelfth month of the eighth year. Our model requires that the invisibility ought to have begun at least a month earlier than that." The month delay (before the period of the "Golden Throne") might suggest that Venus had changed the shape of its orbit, perhaps moving its perihelion to a different location along its orbit, although Rose and Vaughan claim that the orbit of Venus did not change during this period. Rose and Vaughan suggest that in this case the Venus Tablets of Ammizaduga might have misspelled the name of a month. Augustine quotes a lost document by the Roman Varro of the first century BC, but places the event at the time of the Exodus. Homer makes no mention of Phaethon (except as an epithet for Helios), unless we were to understand the pouting of Achilles represents the unwillingness of Jupiter to act in response to the destructiveness of Mars (Ares) for 120 years. Hesiod mentions Dawn as the parent of Phaethon. Apollodorus does the same in the second century AD. A document attributed to Hyginus in the same century also mentions the ride. In many instances Phaethon is equated with Saturn and, more often, with Jupiter. Marinus van der Sluijs has compiled a collection of information from classical authors of the Mediterranean, involving the Great Year, Phaethon (which remains unidentified), comets, and planetary conjunctions in "Phaethon and the Great Year" in Apeiron (2006). All of the information backs up the narrative presented in this text. According to vd Sluijs, what is missing in late antiquity is any clear identification of the planets. I don't have that sense. The retelling of the Phaethon legend by Ovid (43 BC -- AD 17) is correct in detail for the nova event of Venus in 685 BC, except for the timing. Ovid has the whole of the ride of Phaethon happen in one day. But see the "Star Wars" chapter for more; this describes the movement of Venus and Mercury through the skies in accurate detail. When Ovid and other Roman writers describe, "the Earth was burned up," as a detail of the retelling of the legend of Phaethon, they do so correctly. Other exploding blazings in the sky have sent "the fire of Heaven" (Ignis Coelis) to regions of Earth, as late as AD 900. The "Great Chicago Fire" of AD 1871 has been attributed to Ignis Coelis. Large forest fires happened in Northeastern Wisconsin near Green Bay (the "Great Peshtigo Fire") and in Upper Michigan on the same date and on the same evening as the Chicago fire. More recently, the patchwork of simultaneous fires in Southern California in October 2007, looks, from maps of the affected areas, to be distributed in a fashion very similar to the Great Chicago Fire of AD 1871 -- locations separated by many miles, but all along a north-south line. Of course a long rainless season and dry tinder is a prerequisite. But the lightning strikes, which are thought to cause the ignition, were absent. Most of the 170 fires started up simultaneously on July 15. Arson has been suggested, but that would involve an amazing coordination of efforts and fails to even suggest a reason for the efforts. Similar north-south directed strings of fires happened in Greece during 2007 (June 28 and July 15) and Croatia (July 27). The Zend-Avesta are the sacred books of the Parsis of India, the remnants of the scriptures of Zoroastrianism (Mazdaism) at an earlier time in Persia. In 500 BC Herodotus makes indirect references to Zoroastrianism in his discussion of Persian religion. "We sacrifice unto Tishtrya, the bright and glorious star, that afflicts the Pairikas, that vexes the Pairikas, who, in the shape of worm-stars, fly between the earth and the heavens, in the sea Vouru-Kasha, the powerful sea, the large-sized, deep sea of salt waters. He goes to its lake in the shape of a horse, in a holy shape; and down there he makes the waters boil over, and the winds flow above powerfully all around." "The scene of the fight is the sea Vouru-kasha, a sea from which all the waters on the earth fall down with the winds and the clouds; in other words, they fight in the sea above, in the atmospheric field of battle." The Vouru-Kasha is in effect the Absu, imported into the hymn to Tishtrya from much older sources, not untypical of the remainder of the Zend-Avesta, where older "mythological" elements are incorporated in the text. Internal literary consideration would suggest that the actual written texts date from the Sassanian period of Persia, AD 200 to AD 600. "He makes the waters boil over," is generally attributed to the star Sirius, when it would be seen at the east horizon where its path merged with the last remaining ring of the Absu. The image of the planet would flicker. This would also be true of any bright planet found on the ecliptic at the point where it crossed the remaining ring below the equatorial. This is thus a likely condition for planets in June or July, since this time of the year represents the maximum displacement of the ecliptic throughout the night, and planets will very likely be traveling through the last ring below the equatorial for some portion of the night. Velikovsky uses these descriptions as suggestions for the events of 1500 BC, but the composition of the Zoroastrian Avesta dates from well after 600 BC. He notes that editors other than James Darmesteter have described the hymn as a battle of Venus and the stars against the planets. I did not read that into the hymn, but it would be of revealing significance, since indeed the stars end up in complete disarray. I should clear up some other "strange celestial events" which have come to haunt Velikovskian discussions. Astronomical information compiled by Huang Sheng (AD 1146 to 1194) includes the statement that "Once T'ai-P'ai [Venus] suddenly ran into Lang Hsing [Sirius], though it is more than 40 degrees south of the Yellow Road." But to have Venus move this far off the ecliptic (the Yellow Road), and then return, is physically impossible and represents a complete misunderstanding. The text, as it has come down to us, has to represent an emendation of earlier sources. Most likely the phrase "ran into" is an interpretation of "at the same time," not "at the same place." It is amazing that this text was copied without thought from one author to another in antiquity, including the detail of the 40 degrees between Sirius and the ecliptic (the actual separation is 37 degrees in latitude). The "astounding event" in question is the simultaneous heliacal setting of Venus and the heliacal rising of Sirius in AD 350 (about July 10 or so) when they are only 30 degrees apart at the horizon, and after a day or so could be mistaken for each other. This is a very rare event (to be so close together just as the Sun rises), which only happens at 730-year intervals. Since this is a heliacal rising, Sirius had not been seen for months, while Venus had been moving closer to the east horizon, day by day. Just as Venus disappears behind the Sun, Sirius first shows as rising heliacally. Venus is at this point occluded by the rising Sun, and thus Sirius might easily have been misidentified for Venus, making it look as if Venus suddenly jumped off the zodiac. It happened again in about AD 1080, a century before the time of Huang Sheng's compilation, but this event went unrecorded. Sirius is the brightest star in the sky and of about the same magnitude as Venus. "The same ancient tradition was [also] referred to by the early eighth-century AD Chinese astronomer Y-hang. As told by Gaubil, Y-hang wrote that 'in the time of Tsin one saw the star Sirius eclipsed by the planet Venus.'" This is the event noted above which happened in AD 350. The Tsin dynasty dates from AD 265 to AD 420. Hercules sets himself on fire to escape a skin disease brought on by donning a poisoned garment. Mars was seen at close range through portions of the 8th and 7th century BC, and before the eruption of Venus, but did not come close to Earth again thereafter. The sightings were close enough that the Martian landscape is seemingly described by Hesiod in his composition The Shield of Hercules. The sight of the pockmarked and scarred lower hemisphere might have been evidence enough that the planet was suffering from some terrible disease. The later nova event of Venus constituted his funeral pyre. "And to Cephalus she [Eos] bare a splendid son, strong Phaethon, a man like the gods, whom, when he was a young boy in the tender flower of glorious youth with childish thoughts, laughter-loving Aphrodite seized and caught up and made a keeper of her shrine by night, a divine spirit." "She" here is Eos, dawn. As I have pointed out in the text, the electric impact between Earth and Mercury a year earlier (686 BC) reduced Mercury's orbit to fall close to the Sun, so that indeed he would show as the "Morning Star." Thus Mercury at this time had to be reconciled as being "new," so that calling Mercury or Phaethon "the child of Dawn" is perhaps appropriate, since Mercury would only show at dawn, briefly. Only the reference to giving birth keeps this mention from being totally enigmatic, for otherwise we would have to assume that Mercury had been in the position of only showing briefly at dawn for eons. "Some have said it represents the son of Aurora [dawn] and Cephalus [another hero kidnapped by Dawn], who surpassed many in beauty, so that he even vied with Venus." Vd Sluijs elucidates "it" as "the star of Venus," but Hyginus had already identified "it" as Saturn in his text in the then current tradition which assigned "Phaethon" to Saturn or Jupiter. "It" cannot simultaneously "be Venus" and "vie with Venus." But vd Sluijs bolsters the tradition of an abducted Phaethon with other quotes from antiquity. Knowing the placement of the planets in the sky for the years of 686 BC (after March) and 685 BC, all the various attempts at anthropomorphized rationalizations in antiquity start to make sense. It is still somewhat disconcerting to realize that Hesiod, who most likely witnessed the events of 686 and 685 BC, did not make more of it. This suggests that perhaps the mythology of the misguided "chariot of the Sun" and the death by a lightning bolt may have had its source in Asia Minor, the same region which yielded a number of religions based on the death of a Son of God, rather than Greece. "Sauru, which in our texts is only the proper name of a demon, was probably identical in meaning, as he is in name, with the Vedic 'S'aru,' 'the arrow,' a personification of the arrow of death as a godlike being." "The same idea seems to be conveyed by Ishus, 'the self-moving arrow,' a designation to be accounted for by the fact that Saru, in India, before becoming the arrow of death, was the arrow of lightning with which the god killed his foe." Neither the Popol Vuh nor the Chilam Balam has reference to the plasmoid from Jupiter as events, but only as objects. In the Popol Vuh a "bundle" is identified as in the possession of the Quiche tribe by the time they receive their tribal Gods. Considering the 120-year period when the Earth was constantly subjected to lightning strikes from Mars, perhaps it could be understood that a lightning bolt from another planet might have been accepted as matter of fact. But it seems unlikely. I am basing this on timing developed in the chapters "The Books of the Chilam Balam" and "Olmec Alignments," that is, that it took 12 days to travel 484 million miles. Thus the bolt was only seen in the daytime sky as it passed Earth for two and a half days. During two half-day periods of this time the Pacific Ocean faced the traveling plasmoid. During the other times first America, then Asia, and then Europe, in that order, saw the shape in the sky as the bolt passed by. Asia and Europe only saw the bolt as it was approaching and again after it had passed by Earth. The understanding of Olmec iconography is completely submerged under ideas of depicting ears of maize as sacred aspects in a completely unknown philosophy, religion, and social structure of the Olmecs and the people of the Valley of Mexico. See, for example, Karl Taube, in Olmec Art at Dumbarton Oaks (2004). Certainly the Olmecs would see the metaphorical connection between flower-shaped plasma expulsions and ears of maize. The use of a tri-lobed headdress and depictions of ears of maize may have preceded 685 BC. Later Maya iconography clearly depicts the maize iconography. It is curious, however, that sprouted and ripening maize does not look like that. What we think we know about the Olmecs is without exception completely derived by analogy from the structure of our own society. Taube suggests that it is the export of "rich agricultural abilities" and a "symbolism of agricultural fertility and wealth" which provided the exchange basis for raw materials such as jade, as if trading technology for materials. I would suggest that their main export was a religion with a claim of control over the sun and the rain. For the jester-god see the summary of archaeological sources and iconography bearing on this in a paper by Virginia M. Fields, "The Iconographic Heritage of the Maya Jester God" (Los Angeles County Museum of Art, 1991). Almost universally all the retellings of the legend of Phaethon, from 500 BC to AD 500, add the curious detail that as Phaethon dies he falls into a celestial river "Eridanus" (a constellation), or the river Po in northern Italy (also known as Eridanus), but located northwest from Greece. His three, seven, or nine sisters, who mourn his death, are turned into poplar trees along the river, and their tears drop as amber beads into the water. The poplar is a very slim tall tree of the Mediterranean region, and perhaps apt as a representation of plasma plumes. "Gerosus (Pliny l. 17. c. 56.) published the observations of the Celestial Motions among the Babylonians for a period of 480 years. This is the number of years from the beginning of the Epoch of Nabonassar's account [747 BC] as other learned men understand this." Others have pointed out that there are no sensible records for the period of approximately 750 BC to 700 BC, with the exception of the Venus Tablets of Ammizaduga. What we have today is data only from after 650 BC. From the data of the eccentricities, Rose and Vaughan come to the conclusion that the ratio of the synodic periods of Earth and Venus was 1.63. (A synodic period is the time a planet takes to complete one orbit as seen from Earth.) This is close to today's ratio of 1.625. Size of this page: 17387 words.